Avionul a decolat din desertul Mojave si a zburat 2,5 ore, timp in care a atins o viteza maxima de 304 km/h si a urcat pana la 5,1 km (17000 feet). Inainte de aterizare, Stratolaunch a facut un low-pass, spre deliciul celor prezenti. Sistemul de transport orbital Stratolaunch a fost anuntat in decembrie 2011 de catre Paul Allen, co-fondatorul Microsoft, si Bart Rutan, care a lucrat anterior la dezvoltarea SpaceShipOne. Stratolaunch este un sistem de lansare mobil alcatuit din 3 componente: avionul principal, construit de Scaled Composites, denumit “Stratolaunch”, vehiculul care va fi lansat de sub avionul principal spre Spatiu de la altitudini mari si un sistem integrat dezvoltat de Dynetics. Specificatiile avionului pot fi consultate aici. Anvergura aripilor este de 117 metri, Stratolaunch devenind astfel cel mai mare avion din lume. 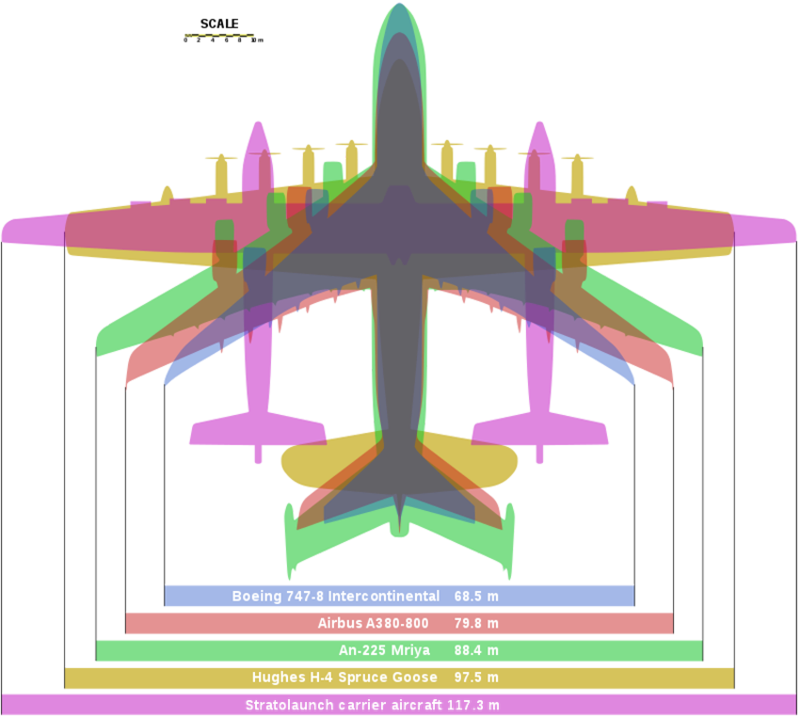 Greutatea este de 540 de tone (inclusiv vechiulul de lansare), iar pentru decolare Stratolaunch are nevoie de o pista lunga de cel putin 3,7 km. Sarcina utila pe care o poate transporta este de 230 de tone. Propulsia este asigurata de 6 motoare Pratt & Whitney PW4000 preluate de la doua 747-400. Autonomia este de 2200 km. Infografic: Wikipedia. 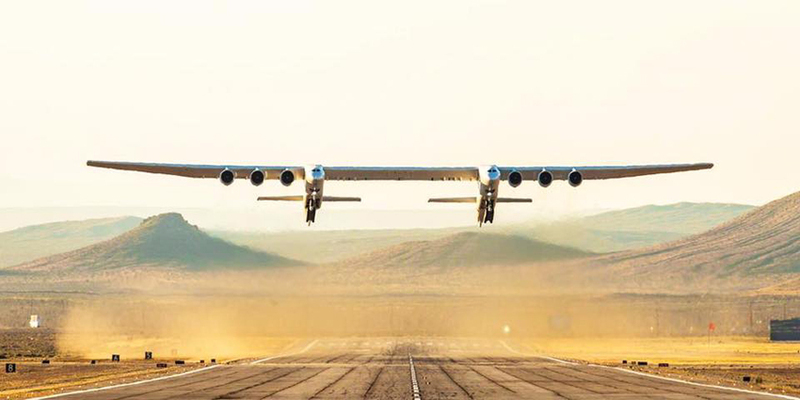 FIRST TAKE-OFF of the world's largest airplane: #Stratolaunch.Video: twitter.com/thejackbeyer. See comments below for photos.➡️ Follow us on twitter.com/AeronewsRO for more updates on this! LOW PASS / #Stratolaunch, the world’s largest airplane, after concluding its first flight. April 13th, 2019. History in the making.Video: twitter.com/thejackbeyer. 🇺🇸 Follow him for more on this! FLYING over the Mojave Desert on its first flight: #Stratolaunch, the world’s largest airplane. 📷 twitter.com/spacecoastpix 🇺🇸➡️ Follow us on twitter.com/AeronewsRO for more updates on this! LOW APPROACH before going around ahead of the landing: #Stratolaunch, the world’s largest airplane. 📷 twitter.com/spacecoastpix➡️ Follow us on twitter.com/AeronewsRO for more updates on this! THE ROC has landed after its first flight! 👏 #Stratolaunch📷 twitter.com/thejackbeyer 🇺🇸 #historyinthemaking #avgeek➡️ Follow us on twitter.com/AeronewsRO for more updates on this!